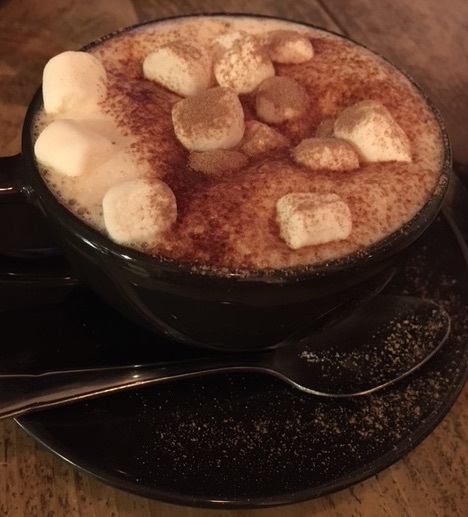 Hot chocolate with marshmallows at HOM, Kings Cross. In these long dark afternoons in the northern hemisphere, what could be better than a warming mug of lovely coffee in a bright environment? And so it was that we ended up at House of Morocco (HoM) on the Caledonian Road. Alerted by Brian’s Coffee Spot that Pattern Coffee had changed hands and become HoM we headed up to Kings Cross one damp afternoon in December to see how things had changed. Entering HoM is a strange mix of déjà-vu mixed with new. The pattern on the wall next to the window remains, as does the layout of the place. However it is also clear that much has changed since HoM took over. There are murals and variously coloured cushions dotted around the café. Even in the darkness of the afternoon, the café was bright, but also crowded. We ordered a soya hot chocolate, a long black and a cheesecake and found a seat perched at a small table for two near the door (the only seat left at the time). The coffee, roasted by Terrone Coffee, was nicely balanced for the afternoon. But it seems that the hot chocolate and cheesecake combination were a real hit. The cheesecake was apparently very good (definitely worth a return visit apparently) while the hot chocolate went very quickly! Inside the café, the windows were steaming up with the warmth of the inside. We over-heard that this was because of the coffee machine rather than any extra heating that had been installed. Does this suggest an alternative energy source? Coffee machine heaters to go with treadmill electricity generators in gyms? Menu with sugar bowl and glazed tile at HOM, Kings Cross. Meanwhile, the decoration was demanding my attention. 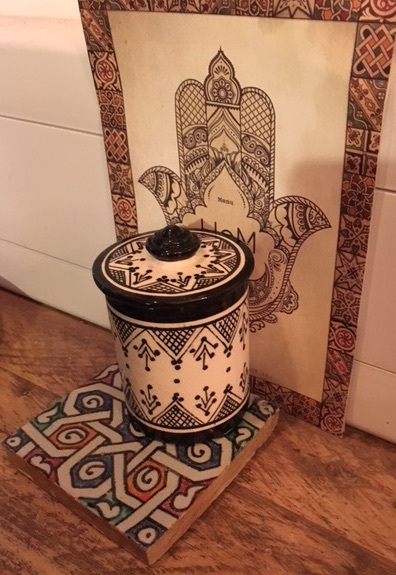 A vividly coloured glazed tile supported a jar of sugar which was propping up a black and white menu. The menu had an illustration reminiscent of henna tattoos while above all of this balanced a peacock feather in a vase. Underneath the peacock feather was a poster advertising the “Phantom of the Opera”. The whole ensemble was suggestive of appearances and how they can be deceptive. The phantom of course wore a mask to disguise his disfigured face. But the peacock? The peacock is hiding something too. Many of the colours that we see around us such as those making our coffee brown and making the tiles colourful are as a result of energy from the light being absorbed by the atoms in the substance (the coffee or the tile). This type of light absorption (and emission) can be connected with vortices in coffee as was discussed here. However the blues and greens in a peacock feather are different. If you look at the feather under a high powered microscope, you will find that the feathers are not dyed as such, in fact the natural colour of the feathers is quite dull. Made from keratin (as you can find in your fingernails) and melanin (responsible for the brown pigmentation of your skin, eyes and hair), the feathers do not seem blue at all. In fact it is the structure in the feather that is producing the colour rather than any dye that produces the colouration. It turns out that there is a long history concerning our understanding of the colours of a peacock’s feather. It started with Robert Hooke who, in 1665 described the feathers of both peacocks and ducks and noticed that the colours he saw under an optical microscope were ‘destroyed’ by putting a drop of water on the feather. A little bit later and Isaac Newton was suggesting that the colouration was due to the thickness of the transparent bits of the feather. There’s a link here to coffee. Newton was suggesting that an effect similar to thin film interference (which causes the rainbow colours on the bubbles in a coffee) was causing the colours of the peacock feather. 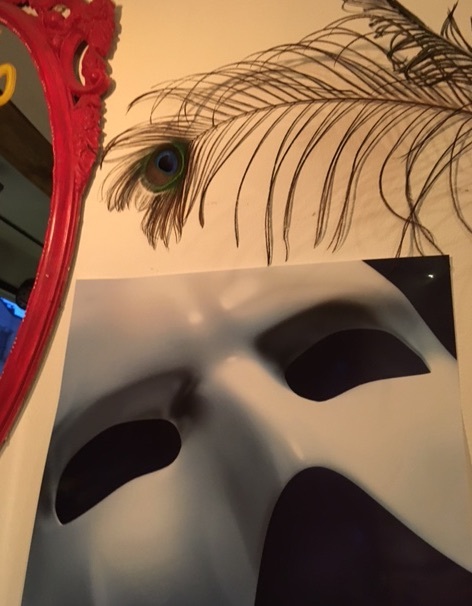 Peacock feather and phantom poster with the top of a mirror. How does structure affect what is seen? As our understanding developed through the centuries (and the microscopes became more powerful), it became apparent that while thin film interference (and multiple film interference) could cause some animals to appear as if they had certain colours, the peacock, along with some other animals, was a little bit more special. Rather than just being the result of reflection off an interface, the peacock’s feathers showed structure at the nanoscale (1/1000000 of a mm). The keratin and melanin in the feathers were arranged in a square lattice to form what is known as a ‘photonic’ crystal. The way this structure reacted with incoming light meant that only certain wavelengths were reflected from it. Depending on the size of the layering in the feathers, they appeared as blue, green or yellow. There’s clearly a lot more work to do before we can properly explain these “beautiful microstructures”. And plenty of time to do so as we sit enjoying well made coffee and hot chocolate in a bright and warming café.